This article surveys ratification-era statements by defenders of the proposed Constitution enumerating powers that would be reserved to the states. It argues that this evidence of the ratifiers’ intent sheds light on how the Constitution should be interpreted, and that it calls into question the constitutionality of much of what the federal government does today. 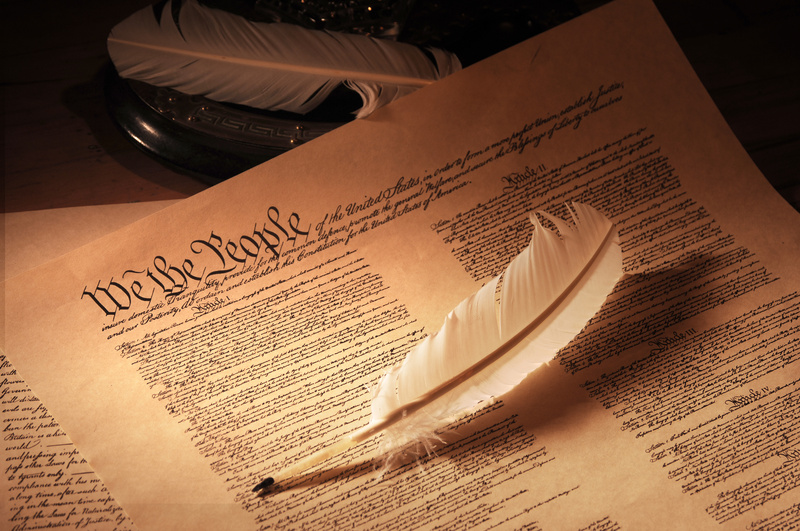 Perhaps the leading issue dividing proponents and opponents during the debates over whether to ratify the Constitution was whether the document granted, or could be construed to grant, excessive authority to the federal government. The well-known demand by opponents of ratification—the Antifederalists—for a bill of rights was merely one important aspect of the larger concern. To at least partially disarm this opposition, the Constitution’s advocates—the Federalists—agreed to adopt a bill of rights. Less well known is that the Federalists repeatedly informed the public of specific powers the Constitution would leave entirely within the jurisdiction of the states and their citizens. This endeavor was not surprising or unusual, nor would it be today. After the sponsors of a legal proposal present it, they generally are asked to explain further its scope and meaning, and they respond by clarifying their proposal in greater detail. That is what the Federalists did after proposing the Constitution. After a legal measure is adopted, the lawyers and judges interpreting it generally give great credibility to the replies given by the original sponsors. They are considered authoritative expositions and representations from those most familiar with the proposal, especially because those who adopted it likely relied upon them. The essays in The Federalist are a premier example of such replies in support of the proposed Constitution, which is one reason we prize them as guides to constitutional interpretation. Unfortunately, the replies made by Federalists enumerating powers reserved exclusively to the states have largely been overlooked. Fifteen years ago, I found most of them in history’s recesses, dusted them off, and reproduced them in a mainstream law review article. Although they have excited some interest, they remain underutilized. The enumerations of powers reserved exclusively to the states are scattered throughout the ratification records. They appeared in essays, letters, convention debates, and newspapers. They ranged in length from short expositions of one or two items to very long lists—although no author claimed to itemize every power the states would retain. The Federalists clearly intended these lists to induce public reliance. They were published and republished. They also evince a certain amount of coordination, for when the enumerations overlapped they remained remarkably consistent. This essay surveys those enumerations and adds some discovered since the 2003 article was published. This essay also focuses, as the 2003 article did not, on the relevant qualifications of the enumerators. Before we proceed, one caveat is in order: When Federalist spokesmen—the enumerators—issued lists of powers reserved exclusively to the states, they necessarily were speaking of conditions within state boundaries. The corresponding limits on federal power would not apply outside the states—that is, in federal territories and enclaves. The federal government neither makes, nor can without alteration make, any provision for the choice of probates of wills, land officers and surveyors, justices of the peace, county lieutenants, county commissioners, receivers of quit-rents, sheriffs, coroners, overseers of the poor, and constables; nor does it provide in any way for the important and innumerable trials that must take place among the citizens of the same state, nor for criminal offenses, breaches of the peace, nuisances, or other objects of the state courts; nor for licensing marriages, and public houses; nor for county roads, nor for any other roads other than the great post roads; nor for poor-houses; nor incorporating religious and political societies, towns and boroughs; nor for charity schools, administrations on estates; and many other matters . . .
To restate the argument in modern terms: State governments will enjoy authority, to the exclusion of the central government, over wills and inheritance, real estate, local government, most areas of civil justice, criminal law, social services, schools, religious and political groups, local road construction, tavern licensing, and domestic relations. Congress . . . will have no power to restrain the press in any of the States . . . To [the state legislatures] is left the whole domestic government of the states; they may still regulate the rules of property, the rights of persons, every thing [sic] that relates to their internal police, and whatever effects [sic] neither foreign affairs nor the rights of other States. The identities of most of the enumerators are known. As detailed in Part III, the majority were lawyers of outstanding reputation. However, some non-lawyer enumerators also enjoyed high levels of credibility. One example is James Madison (1751-1836). At the Virginia ratifying convention, he identified as outside the federal sphere (1) regulation of slaves and slavery, (2) “the law of descents,” and (3) anything that would “subvert the whole system of state laws.” Madison also was among those debunking the claim (still extant in some quarters) that the Necessary and Proper Clause added vast power to the federal store. Madison affirmed that its force was limited to the other enumerated powers. Another non-lawyer, Tench Coxe (1755-1824), was probably the Federalists’ most prolific enumerator of powers reserved exclusively to the states. He was a Philadelphia businessman and in 1789 was a Pennsylvania delegate in the Confederation Congress, which was to expire later that year. After the Constitution was ratified, he served as Alexander Hamilton’s assistant secretary of the treasury. Although little known today, Coxe was one of the most influential ratification-era essayists, and he devoted considerable ink to listing powers outside the federal sphere. a potpourri of other activities, including seminaries of learning, workhouses, poorhouses, hospitals, promotion of manufactures, and regulation of marriages. As to other items, such as construction of public buildings, Coxe was not clear on whether state jurisdiction was exclusive or shared with the central government. Despite the length of Coxe’s lists, nearly all items on them were corroborated by other enumerators. Most of the enumerators were lawyers—indeed, pillars of the bar. In numbers and distinction they far outweighed the few attorneys on the Antifederalist side. (Even Patrick Henry, the most prominent Antifederalist attorney, was known for his passionate oratory rather than his legal ability.) The following lawyer-enumerators are grouped by their states, from south to north. James Iredell of North Carolina (1751-1799) helped lead the pro-Constitution forces at his state’s ratifying convention. Iredell had served as a judge, law revision commissioner, and state attorney general. From 1790 until his death, he was a justice of the U.S. Supreme Court. At the North Carolina convention and in other venues, Iredell emphasized that all authority not granted to the federal government was reserved exclusively to the states and the people. He itemized among the powers not granted (1) control of religion, (2) punishment of crimes other than treason, offenses against the law of nations, or felonies on the high seas, and (3) regulation of slavery. Virginia’s Edmund Pendleton (1721-1803) was his Commonwealth’s leading lawyer—or, arguably, shared top honors with George Wythe. A former justice of the peace, during the ratification he was state chancellor and respected enough to earn the sobriquet “Virginia’s Mansfield” (a reference to England’s greatest chief justice). Like several other enumerators, Pendleton had served as a state law revision commissioner. He chaired the Virginia ratifying convention. In cooperation with Madison, Pendleton debunked the Antifederalist claim that the Constitution’s Necessary and Proper Clause was a vast source of federal power. He maintained that it added no authority not otherwise implied by the Constitution’s grants. Pendleton also asserted that the federal government would have no jurisdiction over inheritances or real property. John Marshall (1755-1835), later America’s greatest Chief Justice, was an up-and-coming Richmond attorney when elected to his state’s ratifying convention. On the convention floor, Marshall emphasized exclusive state control over the militia, land titles, personal property, and contract law. There are other things so clearly out of the power of Congress, that the bare recital of them is sufficient, I mean the “rights of conscience, or religious liberty—the rights of bearing arms for defence, or for killing game—the liberty of fowling, hunting and fishing—the right of altering the laws of descents and distribution of the effects of deceased persons and titles of lands and goods, and the regulation of contracts in the individual States.” . . . The freedom of speech and of the press, are likewise out of the jurisdiction of Congress. Pennsylvania’s James Wilson (1742-1798) had been educated at St. Andrews College (now University) in Scotland and at the College of Philadelphia (now the University of Pennsylvania). Wilson learned law from the master: his teacher, John Dickinson, was not only a leading Founder, he was also Pennsylvania’s foremost lawyer. Wilson was a member of Congress, a particularly influential delegate to the Constitutional Convention, and ultimately a Justice on the U.S. Supreme Court. Although he personally favored a powerful central government, Wilson repeatedly represented that under the Constitution that government would enjoy only those powers enumerated and no others. Like Madison, Pendleton, and Hamilton, he defended the Necessary and Proper Clause as no more than a recital. He affirmed that, even without a bill of rights, the federal government had no power to abridge freedom of the press.
. . . Laws respecting criminal offenders in all cases, except Treason . . . The regulating Towns, parishes, Providing ministers, schools, looking after Poor persons, punishing Idlers, vagabonds . . . regulating Highways, bridges, fisheries, common fields &c . . . regulating inheritances, descent of estates, Partition of them, last wills and Testaments, executors, Administrators, and Guardians . . . determining all controversies between our own citizens, Rules of Legitimacy, marriage and divorce . . . In other words, criminal law, local government, religion, education, social services, infrastructure, wills and inheritance, domestic relations, and most economic regulation were all outside the federal sphere. An essay signed “Harrington” implied that real estate was within exclusive state jurisdiction. The author may have been a prominent Massachusetts attorney named Perez Morton (1751-1837). Morton was a Harvard graduate who would later be state attorney general and speaker of the state house of representatives. With the possible exception of the enumeration by Justice Sargent (which was originally made in a private letter), all these representations were published specifically to induce reliance by voters and ratifying convention delegates. Each representation (other than Sargent’s) was issued on the convention floor or disseminated in the newspapers or, as with Hanson’s work, printed in pamphlet form. All can be considered part of the ratification bargain insofar as they were heard and considered by the ratifiers and helped to induce them to ratify the Constitution. Even construed narrowly, these representations cast grave doubts on the constitutionality of many of the federal government’s current operations. Extensive federal intervention in criminal law, for example, directly contradicts repeated Federalist assurances that, with few exceptions, criminal law would remain exclusively a state concern. But many of these representations should not be read narrowly, for their language necessarily communicates wider messages. For example, the representation that the central government cannot license taverns implies that it has no power to license hotels and restaurants. The reservation to states of the power to regulate agriculture logically extends to regulation of other fixed-location businesses. The fact that the Constitution denied to the federal government the power to dictate to newspapers necessarily communicates that it has no power to control what is said in other organs of mass communication. All of these examples suggest strongly that the enumerators considered the Constitution as reserving to the states alone the power to regulate local business. Furthermore, the assurance that Congress could not regulate slavery communicates the wider message—which some enumerators made explicit—that Congress could not regulate other kinds of property or domestic relations. Thus, when the necessary implications of these representations are taken into account, the charge of illegitimacy clouds a very large portion of modern federal activities. Nor can these representations be dismissed as the rantings of marginal figures. Other than perhaps Hamilton, whose centralizing views were extreme, none of these enumerators was out of the political mainstream. All were prominent and highly respected citizens. The attorneys among them—which is to say, most of them—adorned the legal profession in their respective states. Professionals of the quality of Edmund Pendleton, James Iredell, and Nathaniel Chipman understood the Constitution as a legal document. They knew the circumstances toward which its terms were addressed. They were vastly knowledgeable, and proficient in contemporaneous methods of documentary interpretation. Moreover, they spoke or wrote immediately after the Constitution was written and while it was still under active public consideration. Such facts render their representations far more probative of constitutional meaning than much of what is cited in legal commentary today—or, for that matter, taught in law school courses that pretend constitutional law began in 1803. Indeed, on matters of constitutional meaning, if a twentieth century Supreme Court opinion (even a unanimous one) contradicts the likes of Nathaniel Peaslee Sargent or Alexander White, then my money is on Sargent and White. If the contest is between Sargent and White and any modern law professor, I’ll raise the ante. Material of such interpretive force is entitled to far more attention than it has received. Robert G. Natelson, The Enumerated Powers of States, 3 Nev. L.J. 469 (2003) [hereinafter Enumerated]. The article has sparked interest mostly among the lay public. See, e.g., the reproduction at the Tenth Amendment Center, http://tenthamendmentcenter.com/2009/10/08/enumerated-powers-of-states/. E.g., “A Native of Virginia,” Observations upon the Proposed Plan of Federal Government, Apr. 2, 1788, in 9 The Documentary History of the Ratification of the Constitution 655, 691-92 (Merrill Jensen, John P. Kaminski & Gaspare J. Saladino eds., 1976-2017) [hereinafter Documentary History] (claiming that “Congress . . . will have no power to restrain the press in any of the States” and arguing that it will not do so in the capital district); 3 The Debates in the Several State Conventions on the Adoption of the Federal Constitution 40 (Jonathan Elliot ed., 2d ed. 1901) [hereinafter Elliot’s Debates] (quoting Edmund Pendleton at the Virginia ratifying convention as referring to limitations of federal power within state boundaries: “Can Congress legislate for the state of Virginia . . . or make a law altering the form of transferring property, or the rule of descents, in Virginia[? ]”); “Harrington,” American Herald, Oct. 15, 1787, in 4 Documentary History, supra, at 76, 79 (implying that states will have exclusive power over “real estates, provided they lay within their own limits, and the title thereof is contested by two of its own citizens”). This item was omitted from Enumerated, supra note 1, because I had not yet found it. Pa. Gazette, Dec. 26, 1787, 2 Documentary History, supra note 2, at 650. The style suggests the item was written by Tench Coxe, about whom see infra at section II. Mass. Gazette, Jan. 8, 1788, in 5 Documentary History, supra note 2, at 651. See id. at 652 for the editor’s report of the heading. “A.B.,” Hampshire Gazette, Oct. 18, 1787, in 5 Documentary History, supra note 2, at 599. Id. See also “Harrington,” American Herald, Oct. 15, 1787, in 4 Documentary History, supra note 2, at 76, 79 (implying that states will have exclusive power over “real estates”); Plain Truth: Reply to An Officer of the Late Continental Army, Independent Gazetteeer, Nov. 10, 1787 in 23 Documentary History, supra note 2, at 216 (reciting state reserved powers over the militia). “A Native of Virginia,” Observations upon the Proposed Plan of Federal Government, Apr. 2, 1788, in 9 Documentary History, supra note 2, at 655, 691-92. 3 Elliot’s Debates, supra note 2, at 453 (stating to the Virginia ratifying convention, “No power is given to the general government to interpose with respect to the property in slaves now held by the states”); id. at 621-22 (claiming there is “no warrant” for believing the federal government could emancipate slaves). Id. at 620 (stating, in arguing against a bill of rights, “Can the general government exercise any power not delegated? . . . Does the Constitution say that they shall not alter the law of descents, or do those things which would subvert the whole system of the state laws?”). 3 Elliot’s Debates, supra note 2, at 455 (“With respect to the supposed operation of what was denominated the sweeping clause, the gentleman, he said, was mistaken; for it only extended to the enumerated powers. Should Congress attempt to extend it to any power not enumerated, it would not be warranted by the clause.”). On the background and meaning of the Necessary and Proper Clause, see Gary Lawson, Geoffrey Miller, Robert G. Natelson & Guy Seidman, The Origins of the Necessary and Proper Clause (Cambridge Univ. Press 2010). Jacob Cooke, Tench Coxe and the Early Republic 111 (1978). “One of the People,” Pa. Gazette, Oct. 17, 1787, in 2 Documentary History, supra note 2, at 186, 190 (“The freedom of the press and trials by jury are not infringed on . . . I repeat again, that the Federal Constitution does not interfere with these matters.”). “A Freeman I,” Pa. Gazette, Jan. 23, 1788, in 15 Documentary History, supra note 2, at 453, 458. Id. A “post road” was not any road over which the mail traveled. It was an intercity road punctuated by “posts” or stations featuring inns, stables, and other facilities. Essentially, it was the eighteenth-century analogue to the modern limited-access interstate highway. See Robert G. Natelson, Founding-Era Socialism: The Original Meaning of the Constitution’s Postal Clause, 7 British J. Am. Legal Studies (forthcoming, 2018). “A Freeman II,” Pa. Gazette, Jan. 30, 1788, in 15 Documentary History, supra note 2, at 508. Id. See also “A Freeman I,” supra note 15. “A Freeman II,” supra note 18. Id. See also “A Freeman III,” Pa. Gazette, Feb. 6, 1788, in 16 Documentary History, supra note 2, at 49, 51 (the “lordship of the soil”). This representation rings hollow to many modern inhabitants of Western states, where the federal government owns much of the land. Id. at 510 (italics in original). Id. Still another of Coxe’s enumerations, also recovered since the recovery of Enumerated, supra note 1, appeared in “A Pennsylvanian to the New York Convention,” Pa. Gazette, Jun. 11, 1788, in 20 Documentary History, supra note 2, at 1040, 1042. Its lists, which included criminal law and civil justice, overlapped those in his other writings. “A Freeman I,” supra note 15. Coxe was unclear about whether state jurisdiction over construction of public buildings—including canals, bridges, ferries, light houses, wharves, libraries, and state office buildings—would be exclusive or concurrent with federal jurisdiction. The inclusion of state buildings in this part of the list suggests exclusivity, but if Coxe meant to say the federal government could not construct wharves and lighthouses, he was in error. Construction of such aids to navigation traditionally was part of “regulat[ing] Commerce.” U.S. Const. art. I, § 8, cl. 3; Robert G. Natelson, The Original Constitution: What It Actually Said and Meant 114 (3d ed. 2014) [hereinafter Original Constitution]. Biographical information on these enumerators can be gleaned from their entries in American National Biography Online, http://www.anb.org/. 4 Elliot’s Debates, supra note 2, at 194 (telling the North Carolina ratifying convention that Congress will “have no authority to interfere in the establishment of any religion whatsoever”). I understand that clause as not going a single step beyond the delegated powers. What can it act upon? Some power given by this Constitution. If they should be about to pass a law in consequence of this clause, they must pursue some of the delegated powers, but can by no means depart from them, or arrogate any new powers; for the plain language of the clause is, to give them power to pass laws in order to give effect to the delegated powers. 3 Elliot’s Debates, supra note 2, at 441. Id. at 40 (explaining to the Virginia ratifying convention that Congress cannot “intermeddle with the local, particular affairs of the states. Can Congress legislate for the state of Virginia. . . . or make a law altering the form of transferring property, or the rule of descents, in Virginia?”). Has the government of the United States power to make laws on every subject? Does he [apparently Patrick Henry or George Mason] understand it so? Can they make laws affecting the mode of transferring property, or contracts, or claims, between citizens of the same state? Can they go beyond the delegated powers? If they were to make a law not warranted by any of the powers enumerated, it would be considered by the judges as an infringement of the Constitution which they are to guard. They would not consider such a law as coming under their jurisdiction. They would declare it void. Id. at 553; see also id. at 554 (quoting Marshall as arguing a federal law authorizing trespass would be unconstitutional). On Alexander White, see White, Alexander, (1738-1804), Biographical Dictionary of the United States Congress, https://www.gpo.gov/fdsys/pkg/GPO-CDOC-108hdoc222/pdf/GPO-CDOC-108hdoc222.pdf; 2 Hugh Blair Grigsby, The History of the Virginia Federal Convention of 1788 passim (1891). Alexander White, Winchester Va. Gazette, Feb. 22, 1788, in 8 Documentary History, supra note 2, at 401, 404 (internal quotation marks in original). “Aristides,” Remarks on the Proposed Plan of a Federal Government, Jan. 31 - Mar. 27, 1788, in 15 Documentary History, supra note 2, at 517, 545. Presumably the exclusive state power to promote useful arts referred to methods other than patents and copyrights, over which the Constitution granted authority to Congress. Thus, the states would retain exclusive authority to promote technology through subsidies, monopolies, and the like. 2 Elliot’s Debates, supra note 2, at 454 (stating to the Pennsylvania ratifying convention, “where the powers are particularly enumerated. In the last case, the implied result is, that nothing more is intended to be given than what is so enumerated”). Id. at 468 (“It is saying no more than that the powers we have already particularly given, shall be effectually carried into execution.”). Id. at 384 (disputing the claim at the New York ratifying convention that the Constitution would leave the states without power by exclaiming, “Is the power over property nothing? Is the power over life and death no power?”). Alexander Hamilton, Practical Proceedings in the Supreme Court of the State of New York (1784-86?). See also Francis Paschall, Book Review: The Law Practice of Alexander Hamilton, edited by Julius Goebel, Jr., 40 Indiana L.J. 599 (1965). His most successful effort was the assertion, advanced in his Report on Manufactures, that the Taxation Clause, U.S. Const. art. I, §8, cl. 1, includes an open-ended power to spend for the “general Welfare.” The Supreme Court adopted the theory over a century later in United States v. Butler, 297 U.S. 1 (1936). Alexander Hamilton, The Federalist No. 33 (stating of the clause that it is “only declaratory of a truth which would have resulted by necessary and unavoidable implication from the very act of constituting a federal government, and vesting it with certain specified powers”). 2 Elliot’s Debates, supra note 2, at 344 (listing at the New York convention “the administration of justice and the execution of the civil and criminal laws”); id. at 268 (claiming the Constitution does not permit the federal government to “new-model [i.e., reform] the internal police [i.e., public policy] of any state . . . alter, or abrogate . . . the whole of its civil and criminal institutions . . . penetrate the recesses of domestic life, and control, in all respects, the private conduct of individuals”). Cf. 2 Elliot’s Debates, supra note 2, at 350 (saying at the New York ratifying convention that the states’ “objects are merely civil and domestic—to support the legislative establishment, and to provide for the administration of the laws”). Alexander Hamilton, The Federalist No. 17 (“The administration of private justice between the citizens of the same State, the supervision of agriculture and of other concerns of a similar nature . . . can never be desirable cares of a general jurisdiction.”). If this is not a flat representation, I suspect it was designed to be taken for one. Little has been written on Sargent. See, however, his entry in the Political Graveyard, http://politicalgraveyard.com/bio/sargent.html. Nathaniel Peaslee Sargent to Joseph Badger, 1788 (exact date uncertain), in 5 Documentary History, supra note 2, at 563, 567. “Harrington,” American Herald, Oct. 15, 1787, in 4 Documentary History, supra note 2, at 76, 79 (editor’s note). See also Sarah Wentworth Morton, History of American Women, http://www.womenhistoryblog.com/2012/08/sarah-wentworth-morton.html (discussing Perez Morton’s wife). Morton would have had good reason to keep his name private; he was the subject of a scandal at the time. Id. When I wrote Enumerated, supra note 1, the Vermont volume of the Documentary History, supra note 2, had not been published, and thus I omitted Chipman’s enumeration. Of course, his enumeration occurred just outside the Ratification Era (i.e., from September 17, 1787, when the Constitution became public, until May 29, 1790, when Rhode Island became the thirteenth state to ratify), and therefore has less probative power than enumerations issued within that period. For a discussion of the extent to which the Vermont proceeding are probative of original understanding, see Robert G. Natelson, New Information on the Constitution’s Ratification—Part III: Vermont, https://i2i.org/new-info-on-the-constitutions-ratification-part-iii-vermont/. 29 Documentary History, supra note 2, at 204 (speaking at the Vermont ratifying convention, Jan. 7, 1791). Of course slave “property” was abolished by the Thirteenth Amendment, but that amendment did not alter the federal-state balance as to more defensible forms of property and domestic relationships. Some modern federal operations seen by the Founders as outside the federal sphere are authorized by subsequent constitutional amendments, e.g., U.S. Const. amend. XIV, §5, but this is not true of most such operations. Of course, this fact serves to increase the credibility of his acknowledgments of federal limitations. That was the year of the Supreme Court’s decision in Marbury v. Madison, 5 U.S. 137 (1803), the traditional starting point for law school constitutional law courses. In fact, a sound understanding of the Constitution requires that one begin centuries earlier. See generally Original Constitution, supra note 25. In United States v. Darby Lumber Co., 312 U.S. 100 (1941) a unanimous court held, apparently under the Necessary and Proper Clause, that Congress could use its Commerce Power to regulate the manufacturing process. In my view, this result virtually dictated the more famous decision the following year in Wickard v. Filburn, 317 U.S. 111 (1942), when the Court, once again apparently relying on the Necessary and Proper Clause, unanimously extended the Commerce Power to agriculture. Compare these holdings with the representations of Justice Sargent, Alexander White, and Alexander Hamilton to the effect that most economic regulation would be reserved to the states. On the inaccurate objection that the Founders didn’t understand these economic activities were closely related, see Robert G. Natelson, The Legal Meaning of “Commerce” in the Commerce Clause, 80 St. John’s L. Rev. 789 (2006). For example, Yale Law Professor Jack Balkin’s claim that the constitutional term “commerce” refers to all interactions among people, Jack M. Balkin, Commerce, 109 Mich. L. Rev. 1 (2010), collapses before the Federalists’ clear representations on the limits of federal power. See Robert G. Natelson & David Kopel, Commerce in the Commerce Clause: A Response to Jack Balkin, 109 Mich. L. Rev. First Impressions 55 (2010).